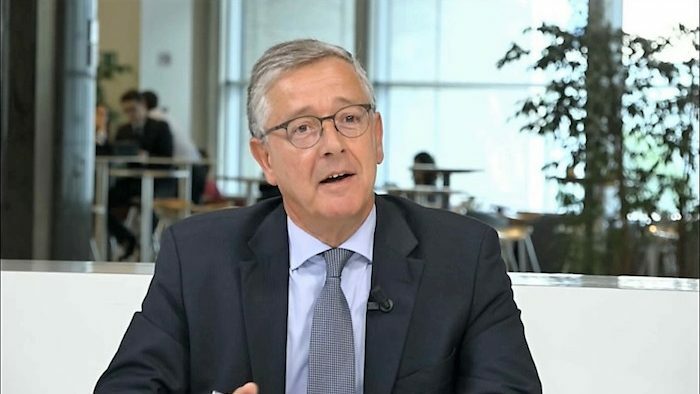 João Aguiar Machado has been Director General for Maritime Affairs and Fisheries at the European Commission since September 2015. He is in charge of implementing the EU Common Fisheries Policy and promoting an integral approach to the EU Maritime Policy. Before taking up his current position, Mr Machado was Director General for Mobility and Transport at the European Commission. Between 2009 and 2014, Mr Machado was Deputy Director General at the European Commission’s Directorate-General for Trade. He was responsible for bilateral trade relations with Asia, Latin America and Africa, including many of the EU’s free trade negotiations, and for trade in services, investment, intellectual property and public procurement. From September 2007 to December 2008 he was Deputy Director-General at the EC’s Directorate-General for External Relations – where he was in charge of coordinating EU relations with Asia and Latin America. Aguiar Machado spent most of his career working on trade matters in Brussels and in EC Delegations in Tokyo, Japan (1989 – 1994), and Geneva, Switzerland (WTO, 1994 – 1998). Mr Machado studied economics both in Lisbon and at the College of Europe in Bruges. Where do you see the most exciting debates happening in your field of work? The European Commission’s fisheries and maritime policy is about one thing above all: protecting the treasures of the seas and oceans in Europe and around the world, so that future generations can continue to use their resources for economic gain. Ensuring sustainability in all its facets – economic, environmental and social – is therefore the driving force behind every action we take. Incidentally, this is an objective shared by everyone – from European and national politicians, to civil society organisations, to fishermen themselves. What I find particularly fascinating in this field is how this overarching, shared sustainability objective gets translated into policy and then into specific action on the ground. Here the European Union has the Common Fisheries Policy to guide us. By 2020, all fish stocks in Europe need to be fished at sustainable levels. But we have also realised that healthy, sustainable oceans require much more than just focusing on fish. Fisheries are part of the broader “blue” maritime economy, with exciting developments taking off in other sectors like coastal tourism, maritime bio-economy or aquaculture. It’s also our job to remove roadblocks for those sectors and make sure they can attract a fair share of private investment and skilled people. All while keeping an eye on the bigger picture beyond Europe and working with our international partners – after all, many ocean challenges like marine litter, climate change or overfishing know no borders. What are the biggest challenges for the Common European Fishing Policy (CFP)? We really should be talking about the ‘Common Ocean Policy’ because we know that healthy and productive oceans are key to long-term sustainable development. Ours is the first generation to experience the impact of decades of overfishing and pollution of our oceans. At the same time, we may also be the last generation that can decisively turn around the situation and ensure full recovery of our seas. We owe that to the generations that come after us, including to future fishermen. Our overall challenge is to ensure that our seas and oceans are and remain healthy and productive so that they can continue to support the livelihoods of coastal communities and so that future generations can continue to reap the benefits of the rich bounty they have to offer. This requires decisive action. We need to tackle marine litter such as the plastic that is building up in the oceans. Fish stocks in many areas continue to be overexploited. Urgent action, both at national, regional and international level, is needed to tackle these problems. The European Union is leading the way. One of my priorities as Director General for Fisheries and Maritime Affairs is implementing the reformed Common Fisheries Policy (CFP). The CFP aims at ensuring that fishing and aquaculture are environmentally, economically and socially sustainable. Not only does this provide EU citizens with healthy and traceable food – it also fosters a dynamic and profitable fishing industry and ensures a fair standard of living for fishing communities. Another challenge will be to make fishing fleets more selective in what they catch, and to phase out the wasteful practice of discarding unwanted fish. By 2019, all European fisheries using a quota will be covered by the landing obligation, prohibiting the practice of throwing unwanted catches back into the sea. There are already signs that our work is paying off. Fisheries in Europe are making steady progress towards our sustainability target. In the Northeast Atlantic area (including the North and Baltic Seas), the push towards sustainability is both widespread and visible. While in the early 2000s most stocks were overfished, today more than half of the (assessed) stocks are managed sustainably, and this includes many of the largest and commercially most valuable stocks. This is not just good news for fish stocks, but for fishermen as well. New Commission data finds that – with net profit margins at 10% – the EU fleet made high profits in 2015, thus increasing its economic performance significantly compared to 2008. However, progress has not been uniform: fish stocks in the Mediterranean and Black Seas continue to fare poorly and most of them are still overfished. As our scientific knowledge of these seas improves, the challenges to fisheries in the area become obvious. What is the significance of the Black Sea Region (BSR) for the EU? What is the EU’s strategy towards making the BSR environmentally sustainable? The Black Sea is an area of impressive cultural, ecological and economic wealth, and fisheries and aquaculture have very important role to play when it comes to the protection of livelihood, food security and a sustainable long-term development of this region. In the Black Sea, fisheries directly support the employment of about 23,500 people, with many more jobs indirectly dependent on the fishing sector. In riparian countries, an estimated 8,700 aquaculture farms, both marine and freshwater, generate direct and indirect jobs for more than 39,000 people. Fisheries and aquaculture are important for the Blue Economy in the Black Sea. In Bulgaria and Romania alone, the five largest sectors of the blue economy create a total of 160,000 jobs and a Gross Value Added of over 1.2 billion euro. The Black Sea is different from other sea basins in terms of natural environmental conditions. In terms of fisheries conservation, the situation is very worrying, as of 8 assessed stocks (turbot, anchovies, sprat, horse mackerel, whiting, red mullet, piked dogfish, rapana), 6 stocks remain overfished. Only sprat and rapana are not. It is true that in the past, the cooperation between Black Sea riparian countries was weak due to the lack of political will and to the fact that not much attention was given to this area. The result was that we had only a few General Fisheries Commission for the Mediterranean (GFCM) recommendations for the Black Sea. In addition, there was no project to ensure the scientific cooperation between riparian countries. This led to a lack of stock assessments. Illegal, unreported or unregulated (IUU) fishing also remains an endemic problem in this sea basin. The Commission has taken the initiative to address key challenges for fisheries policy in the Black Sea and indeed over the past 2 years we have been promoting actively a new strategy for the Black Sea fisheries. In this context, we have worked together with the GFCM in introducing very concrete objectives for the Black Sea. We have also worked together in mobilising political commitment for changes in the Black Sea, as reflected in the 2016 Bucharest Declaration to promote sustainable fisheries and aquaculture development in the Black Sea, based on enhanced cooperation. Some early positive deliverables have already been achieved: a multi-annual plan within GFCM for turbot fisheries, or a Regional Plan of Action against IUU fishing adopted last year. The GFCM, the European Commission and the riparian Black Sea States recently adopted the Sofia Declaration, which lays out a detailed work plan with common actions for the next 10 years to enhance data collection and scientific evaluation, establish an ecosystem based fisheries management, develop a culture of compliance and eliminate IUU fishing and support sustainable small scale fisheries and aquaculture. Sustainable fishing presents a classic collective action problem. Who are the main stakeholders within the BSR? Which is the most viable approach to promoting cooperation in this context – top down or bottom up? The Bulgarian fishing fleet consists of approximately 1,900 registered vessels with 90% being small scale (less than 12 meters). The Romanian fishing fleet consists of approximately 150 registered vessels, with 75% being small scale (less than 12 meters). In terms of our main stakeholders in fisheries, we work actively with the national fisheries authorities in the two Black Sea countries to improve the sustainable exploitation of marine resources and to increase economic performance and employment. But apart from the direct impact on the fisheries business, there is also the social-economic impact on the coastal communities. Fisheries in the Black Sea play an important role in supporting the social fabric of these coastal communities. Community Led Local Development groups can bring greatest benefits for fisheries communities in relation to the challenges that these areas are facing and their potential for growth. Fisheries Local Action groups (FLAGs), funded by the European Maritime and Fisheries Fund, are the best example of a successful bottom up approach, building up on community’s social, environmental and economic strengths. We are also working closely with the authorities of our two Black Sea Member States when it comes to actions to improve the sustainability of fisheries resources, through the implementation of CFP objectives and the improvement of control and data collection capacities. And we are very active on a multilateral level, through the work in GFCM, in order to reform the multilateral fisheries management system in the Black Sea and thus to improve the level playing field in this sea basin. At EU level, the Advisory Council for the Black Sea (BlSAC) ensures a balanced representation of all fisheries and aquaculture stakeholders from Bulgaria and Romania and is thus a key player and interlocutor for the Commission. Within the BSR Bulgaria and Romania are two of the worst performing EU states regarding the quality of governance and sustainability. Can the CFP succeed in this region? The Commission is working actively and closely with both Bulgaria and Romania to make sure that the CFP objectives, which all EU Member States have signed up to, are met throughout the EU, in all regions and sea basins. On control issues, both Bulgaria and Romania have on-going actions plans to improve control of fishing activities and work is developing in a satisfactory way; and we are also working with these two Member States on actions to improve data collection. A combined approach, targeting both the EU and the multilateral level is the best way towards a successful implementation of the CFP objectives in this strategically important region. While at EU level we support the reform of the national fisheries management systems in Bulgaria and Romania, at international level our work on conservation issues is channelled through GFCM. Bulgaria and Romania control only 10% of the Black Sea, which makes it imperative that actions to address sustainable development of maritime resources are implemented commonly by all countries concerned. Apart from Bulgaria and Romania these are Georgia, the Russian Federation, Turkey and Ukraine. The Baltic Marine Environment Protection Commission (HELCOM) has been quite successful when it comes to a co-operative sustainable fishing and environmental policy in a large-scale multinational setting. Could a similar framework be implemented in the BSR? In the Black Sea, a cooperative and collaborative approach to fisheries and environment is already established through the coordinated work of regional and international bodies. Interactions and synergies have been strongly promoted in new fisheries governance for the Black Sea. HELCOM is a body developing environmental policy recommendations for the Baltic Sea area. In the Black Sea, issues concerning fisheries conservation are governed by the General Fisheries Commission for the Mediterranean (GFCM), a Regional Fisheries Management Organisation. The objective of the GFCM is to ensure the conservation and sustainable use of the biological, social, economic and environmental level of living marine resources in the Mediterranean and Black Sea basins. In this context the GFCM has developed its strategy, linked to the UN Sustainable Development Goal 14 (Life under Water), towards the sustainability of Mediterranean and Black Sea fisheries. The GFCM is also implementing an ecosystem-based approach in fisheries management in the Black Sea with the aim to minimise and mitigate unwanted interactions between fisheries and marine ecosystems and environments. In the Black Sea, also other international organisations are dealing with environment related issues like the Bucharest Convention (also called the Convention on the Protection of the Black Sea against Pollution), as the Agreement on the Conservation of Cetaceans of the Black Sea, Mediterranean Sea and Contiguous Atlantic Area (ACCOBAMS). The GFCM has an established policy to collaborate and work together with those regional bodies dealing with environmental issues in the Black Sea. The Commission hopes that all the different regional commissions or conventions working together on marine environmental protection issues as well as the regional groups working on fisheries management issues can continue to collaborate to develop regional solutions to regional problems, knowing that each of Europe’s sea basins requires a unique and collaborative way of working together, each adapted to the particular regional situations and traditions. What is the situation with maritime issues in the Black Sea? The Commission is supporting actively the cross-border cooperation on maritime issues around the Black Sea. On 31 May 2018 in Burgas, Bulgaria, in the margins of the European Maritime Day, Ministers and representatives from Bulgaria, Georgia, Moldova, Romania, Russia, Turkey and Ukraine reaffirmed their commitment to work more closely with the endorsement of a Declaration towards a Common Maritime Agenda for the Black Sea. We hope to see a common maritime agenda taking shape by 2019, with coastal states launching joint action the following year.